Announcement >>>We specialize in Inspirational Vinyl wall decals. Welcome to Inspirational Wall Signs! Our shop is dedicated to using only the King James Version in all of our Scripture decals and we provide high quality, Scripture Vinyl Wall Decals, as well as Custom Decals and many other inspirational quotes for the home, office, school and just about any other place you could imagine! Do you have a special saying or decal that you have always wanted to display on your wall? Contact us with the details and we will help you create the perfect decal...customized to fully fit your needs! We also provide many different wall quotes, KJV Bible passages and inspirational wall decors. These wall vinyl signs are a great addition any room in your home such as your living room, bedroom, baby nursery, personal fitness room and so many more! Our wall decals also make innovative and beautiful gifts for any holiday or special occasion. Please let us know if we can help you create the decal you have always dreamed about placing in your special space! Thank you for stopping by and please, enjoy perusing our vast selection of decals. We're here to help and are ready to answer any and all questions that you might have so please do not hesitate to reach out. >>>We specialize in Inspirational Vinyl wall decals. Bible and Religious Vinyl Wall Decor for your Living Room, Bedroom or Dining Room. Only Highest Quality Material Used. Scripture and Christian Wall Decal for your Bedroom, Living Room, Nursery. Only Highest Quality Material Used. Bible Verse Wall Art & Scripture Wall Art. Our Christian Wall Art will look great in any room of your home wall decor. Scripture Wall Decal & Christian Bible Verse Wall Decal is a great way to show Christian Wall Decor in any size. Inspirational Wall Art for your wall decor. 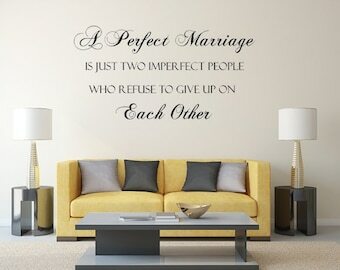 All of our inspirational wall quotes look great in bedroom, living room. Back in the spring of 2012, our family began to notice that there were not many shops offering vinyl wall decals using the King James Bible. Being that we love the KJV, we saw a need and decided to begin a vinyl decal shop that worked with Scriptures using the King James Bible. It has been a joy and privilege to provide decals for homes and businesses across the country and we truly enjoy creating decals for our customers. We provide custom vinyl wall decals for the home decor, personalized wall decals, monogram wall decals, nursery wall decals, inspirational decals and more! Each order is created on an individual basis and we deal with many custom orders. Even the designs we have already created for our shop are fully customizable.